You Can Socialize While on the 21 Day Fix…Who Knew?! I was excited to give this a go since I have always had a love of drawing and art. I was however a bit nervous about the food and drink at the event since I am doing the 21 Day Fix right now. The bright side of the situation is that the party hostess is also doing the program with me, so we were able to chat about food options and what would fit in. We don’t lock ourselves in the house to avoid temptation. We eat foods other than lettuce, carrots and spinach. Healthy food doesn’t mean bland, flavorless and gross. We aren’t perfect and we don’t instantly gain back all of our weight if we eat a cookie. We can enjoy alcohol and treats, in moderation. We also like to have fun and enjoy a night out. I have been to plenty of parties, weddings, bbq’s and the like over the 5 years that I’ve been working on being healthy, so I know how to make smart choices, I just wasn’t sure to plan my entire day around this event while on the 21 Day Fix. Looking back at it now, I made a bigger deal about it than I needed to. If you look at the items you’re allowed to have while on the plan, there isn’t much that is off limits and worst case, you need to go low carb for the day so you can trade in a yellow container for a treat or an alcoholic drink. When thinking about typical party fare, there is almost always salsa, a veggie tray, hummus, fruit, some type of cold cut platter and in the summer there is always a grilled protein option. All of these fit into the program. In this case, the get together was late in the evening, so I already had dinner. I saved a veggie (green container), fruit (purple container) and healthy fat (blue container). I also happened to be short on protein (red container) for the day, because as I mentioned yesterday, I had my son’s end of year party up at his school, so I knew I had plenty of options. I ended up having some grilled chicken strips with pineapple salsa, a little bit of hummus and guacamole with veggies and I had two sips of the cocktail that was being made because it had Angry Orchard in it and I was intrigued, but I didn’t count two sips as a yellow…that’s just silly. Once I had my snack situation all settled, the reality that it’s been years since I’ve painted set in and I became grateful that I ended up with the seat in the back, where no one could see what I was doing. The instructor was very nice and gave us tips on setting up our canvas, how to sketch key items, a little lesson on perspective when drawing and how to mix the paints to achieve the different looks in the photo. The hardest part for me was working with acrylic paint on canvas because it doesn’t blend like oil paints and dried super fast. To me the most enjoyable part was chatting with the other ladies at my table, laughing at our mistakes and realizing that I am not the only person who is way too hard on themselves. We woman really need to learn how to lighten up, we put so much pressure on ourselves. Finished product along with original. Group photo of everyone with their master piece. Overall I had an awesome time, even if I was exhausted by the time we were done. I’m trying to convince my husband to attend a Date Night one with me, but he’s resisting so far. How do you handle events and parties while on the 21 Day Fix or just while being healthy? Do you try your best to stick to your goals or do you say screw it and have a full on cheat day? 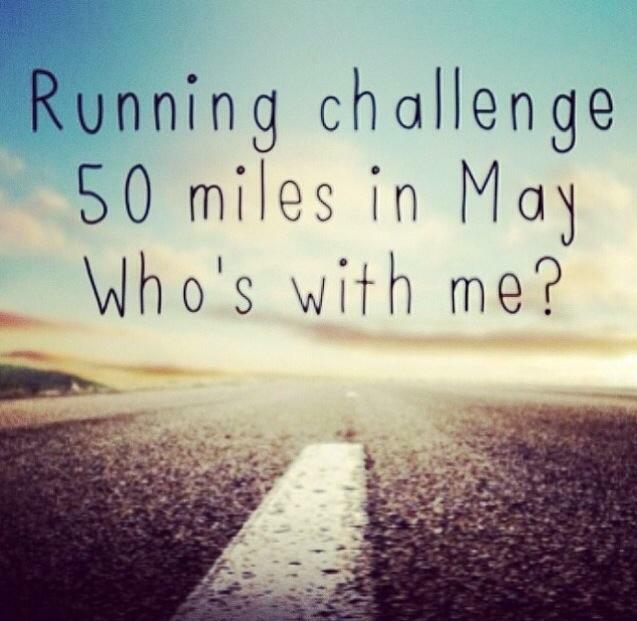 Time for me to challenge you with 30 days of something to make your body a little stronger! Since I’ve had a good response to plank challenges in the past, I figured why not kick off the beginning of spring with one. For the next 30 days, I challenge you to follow the graphic below and do a plank-a-day, with the goal of being able to hold a 5 minute plank by day 30. As you can see, I am not asking for much time per day. You can squeeze this into your day very easily, especially since most of the month only requires 2 minutes or less of your time. That doesn’t sound too bad right? I will be posting a daily accountability post over on the Facebook Page and I invite you to check-in daily. Accountability is so important to staying on track. Plus, you just might inspire someone else to get their plank done, by posting about yours! 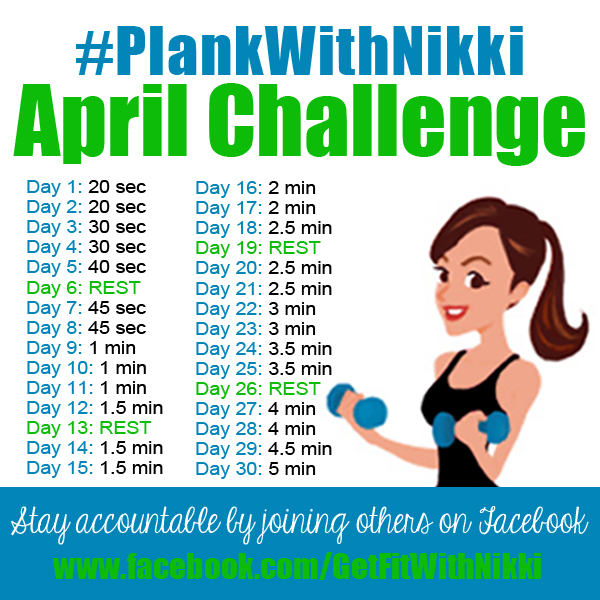 Use the hashtag #PlankWithNikki, especially when posting on Instagram. I love being inspired by others and would love to see what you are up to! Questions or concerns about how to hold a proper plank pose? Check out this post from the archives or post a message to me over on the Facebook Page.